Orioles 1B/DH/ticking time bomb Nick Johnson left Wednesday's game after feeling pain in his right wrist, and after an MRI yesterday was placed on the 15-day DL. Finally! 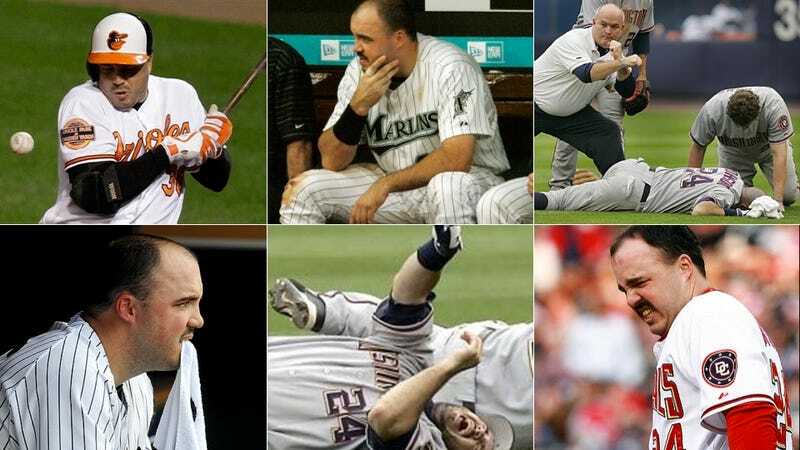 The season's nearly half-over, and we were getting worried that Johnson might finally, after 13 years in MLB, make it through a season without getting hurt. But old reliable came through: that right wrist has already been operated on at least four times. Here's an impressive compendium of Johnson's injury history, perhaps the most dependable sign that summer has come in this new millennium. Interestingly, he's actually avoided the DL five times: twice because he was out the entire season, twice because he was injured during minor league rehab assignments, and once because he had surgery after rosters expanded to 40 men, and the Nationals just said screw it. Johnson signed a minor league deal with Baltimore this spring, and as he wasn't burning up the batter's box before the injury, that'll probably be the best he can hope for next year. There aren't a ton of opportunities for career DHs who can't hit, and can't stay healthy. Which means the end of the line isn't far away, and that makes us genuinely sad. As far as missed potential players go, no one's going to mourn Nick Johnson they way they would someone who could hit 50 HRs or throw a ball 100 MPH. But there's something to be said for getting on base, taking walks and stroking doubles, and unembarrassingly filling a hole in a lineup. Yeoman's work, professionally done. Nick Johnson's greatest strength could have been a quiet consistency, then, if you didn't depend on his brittle bones and fraying ligaments first.